New Mom, New Year is over, but we have an exciting new giveaway for you! I love arts and crafts of all sorts, and I was fortunate enough to grow up with a mother who was a graphic designer, and had all kinds of neat things around which she acquired while in college. One of those things was a laminator, which we used for all types of things---both practical and just for fun. So I bring to you the giveaway for this laminator made by Swingline! I have wanted a laminator for what seems like forever, so when I was asked to review the Swingline™ GBC® Fusion™ 1000L 12″ Laminator, 5 Minute Warm-up, 3 or 5 Mil (up to 4″ x 6″) I was excited. 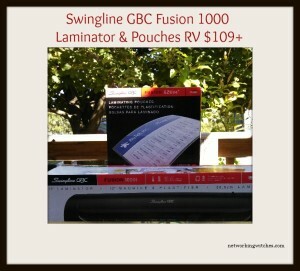 I also received Swingline™ GBC® EZUse™ Thermal Laminating Pouches to help get me started. 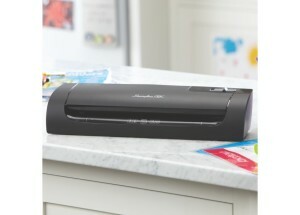 This is Swingline Laminator is easy peasy to work. Just turn it on and let it warm up. It takes about 5 minutes to warm up and there is a green light to alert you when the warm up is complete. It laminates at a speed of 13″ per minute, and allows you a maximum document width of 12″. This is perfect for the home office or a mom who wants to laminate memories for the future. It is perfect for helping to preserve certificates, insurance policies, report cards, and even little hand prints on paper. 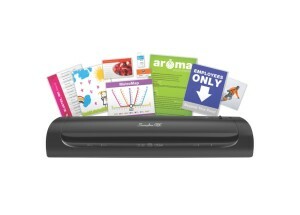 Laminating creates the perfect display and is easy to use. The EZUse pouches are the easiest to use thermal laminating pouches on the market. 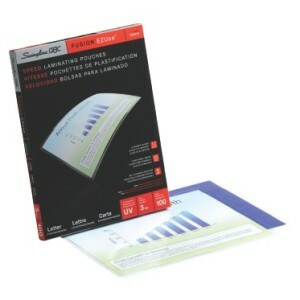 These provide outstanding lamination accuracy and UV protection. The helpful EZUse alignment guides, mil thickness icon, and directional arrow on every pouch helps simplify the laminating process. winterwitch@networkingwitches.com is responsible for prize distribution. Any questions? Give me a holler. I've never used a laminator before. I used to go to Scholar's Choice and pay to have it done. We moved away from the city, and live an 8-hour drive away now! This would be convenient to have at home.